with frequent and volume purchase requirement! Please click on the tabs on the right to start the tour." please call 408-734-5505 for same day or next day service. "Are you getting what you want from your current vendor?" your corporate business cards shipped within 3 days. to place each order in less than 30 seconds. them printed correctly the first time. to be informed about the status of your order. color and quality to be consistent every time. You've just found the right vendor, enstant.com! "Now, it just make sense to 'enstant your next order!" "See what enstant.com can do for you." enstant.com provides you with a quicker, easier and smarter solution to manage your corporate business card orders. enstant.com allows you to place orders, proof for typos and view up-to-the-minute shipping status and order history any time from anywhere is a computer connected to the internet! enstant.com sets up a password protected private web site with all your business cards specifications, i.e. logo, fonts, layout, and ink colors, locked-in to ensure consistency. After typing in name, title, phones, etc for your order, you can instantly preview an electronic artwork of how the card will actually look. This speeds up the proofing cycle and prevents errors. "See if enstant.com is 'Right' for your company." enstant.com is ideal for you if your company orders business cards frequently. That means if your company has a large number of employees, independent agents, multiple offices or is experiencing a period of rapid growth, i.e., hi-tech, financial or hospitallity companies, you will benefit from enstant.com's On-Line Tool. enstant.com understands the benefit of quickly and efficiently providing your staff with the basic, yet important sales tool - the business card.
" To see how easy it is to use our On Line Tool, please click on the Quick DEMO button Below." Click on the Quick DEMO button below to see a quick interactive demo of our On-Line Corporate Business Card Order Tool. enstant.com gives you what you want - when you want it! Enstant.com brings a web-based Business Cards Ordering Tool to growing and established companies looking for quality, consistency and speed. 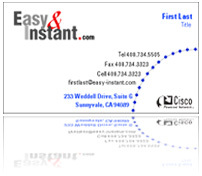 Enstant.com simplifies ordering the basic, yet important, sales tool essential to all businesses - the business card. Our On-Line Tool . . .
 Makes business cards ordering quicker, easier, smarter and more convenient.  Eliminates multiple proofing cycles and prevents errors.  Helps save valuable time and boost productivity.  Gives you control with business card orders.  Speeds up getting business cards, especially for Key personnel.  Benefits you and your company.